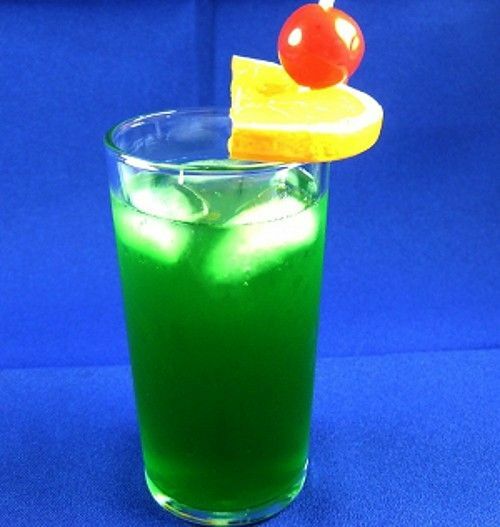 The Leap Frog cocktail gets its name from its bright green color. It’s a tasty combination of tropical, watermelon and orange flavors with vodka. It’s a little bit sweet and sour. The schnapps gives it a nice smoothness that makes it very drinkable. This is a great drink for a night out because it’s fairly strong under that smoothness. The color alone makes it a conversation starter, too. Fill a collins glass with ice. Pour the vodka, followed by the watermelon schnapps, the Blue Maui schnapps and finally the orange juice. Don’t shake or stir. Garnish with a maraschino cherry and an orange wheel.